En route to mountainous Tajikistan's "roof of the world" lies a hastily-erected memorial to four bike tourists killed in an attack claimed by the Islamic State group late last month. Roses and tulips lie scattered at the tribute -- featuring a plaque inscribed in English -- in the foreground of a scrubby mountain landscape. 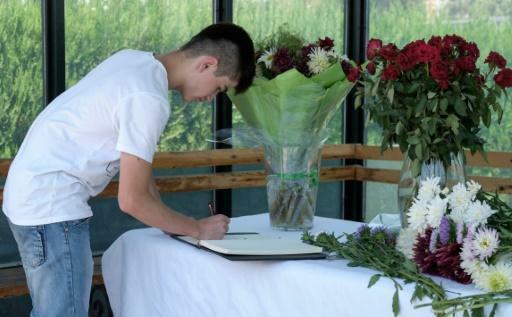 "We express sincere condolences on behalf of all Tajik people and Tajikistan to the families and relatives of the died tourists in our country tragically and cruelly," the plaque reads. It was here, approximately 100 kilometres south of Tajikistan's capital Dushanbe, that American tourists Lauren Geoghegan and Jay Austin, Dutch citizen Rene Wokke and Swiss citizen Markus Hummel were fatally wounded in an attack initially reported as a hit-and-run road accident. The attack comes as a deep blow to Tajikistan, which has been trying to promote the authoritarian country as a tourism hotspot, simplifying visa bureaucracy and even declaring 2018 "the year of tourism." Police said the gang that attacked the group of seven tourists, injuring two others, had also stabbed their victims, while a video released via IS' official media channel indicated the attackers were inspired by the Islamist group. "It was a tragedy," 32-year-old account manager and biking enthusiast Pau Ros told AFP ahead of a seven-day cycle over Tajikistan's legendary Pamir Highway with girlfriend Mariona Miranda. "This happens around the world now. But we are not going to change our lives because that is what these bad people would want," said Ros, who is a native of Barcelona. Authorities have played down video evidence that appears to show five men -- four of whom they say were killed resisting arrest -- swearing an oath of allegiance to IS leader Abu Bakr al-Baghdadi. On Friday Tajikistan's state prosecutor said the clip had been released "with the aim of deflecting suspicions from another terrorist organisation -- the Islamic Renaissance Party", a former opposition party banned by the government in 2015. The IRPT has refuted links to the attack, as has Iran, a country that Tajikistan has poor ties with and says provided training to a 33-year-old man called Hussein Abdusamadov, who was detained for allegedly leading the attack on the cyclists. In a brief interview with AFP, the mother of Abdusamadov, who was shown sporting a black eye in his police photo, could not say if he had traveled to Iran but said he spoke Arabic and had worked in Russia, a migration destination for hundreds of thousands of Tajiks. "We do not know when he came back to (Tajikistan). The police just came to our door and told us he had committed a crime," Gulchekhra Shodmonova told AFP. Analysts have pointed to a number of reasons to doubt the official narrative linking IRPT and Iran to the attack -- chiefly a downturn in Tajikistan's relations with Iran, an intensified crackdown on the opposition since 2015 and the IS video evidence. Mahmudjon Faizrahmon, a spokesman-in-exile for the party that has always described itself as peaceful opposition force said on Thursday that police brought his 62-year-old mother for questioning after he denied links between the party and the attack on Twitter. In addition to Abdusamadov, Tajikistan's prosecutor says 10 people have been detained under suspicion of financing the crime and failing to supply information to police before the attack took place. At the US embassy in Dushanbe, Tajikistan, a simple bicycle donated by a local student provides a fitting flourish to a display honouring 29-year-old Geoghegan and Austin, whose blog Simplycycling.org was popular among other bike-the-world cyclists. The pair whose photo stood on a table at the heart of the display described themselves as enthusiasts who fell in love with cycling in adulthood but were not above "hitching a ride when a stretch of road is dangerous or just awful." It is uncertain how the attack from which only one tourist, a Frenchman, emerged unscathed, will affect one of the few sources of economic optimism in the poorest country to gain independence from the Soviet Union. Tajikistan announced plans to create a "tourist police" earlier this week, but provided few details. One representative of a Bed and Breakfast in Dushanbe told AFP that a Polish tourist who had planned on cycling the highway had flown home.